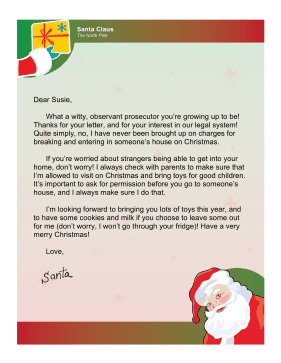 Address concerns of Santa's legal right to enter the home with this funny letter about breaking and entering. What a witty, observant prosecutor you're growing up to be! Thanks for your letter, and for your interest in our legal system! Quite simply, no, I have never been brought up on charges for breaking and entering in someone's house on Christmas. If you're worried about strangers being able to get into your home, don't worry! I always check with parents to make sure that I'm allowed to visit on Christmas and bring toys for good children. It's important to ask for permission before you go to someone's house, and I always make sure I do that. I'm looking forward to bringing you lots of toys this year, and to have some cookies and milk if you choose to leave some out for me (don't worry, I won't go through your fridge)! Have a very merry Christmas!